Now if you're like me, friends, you don't just want to watch Star Trek. You want to captain your own starship, am I right? But you can't captain your own starship. No, that's crazy talk! But you can do the next best thing with Artemis: Starship Bridge Simulator, a PC game that can turn your living room (or any other room) into a virtual starship. No, it's not just a space simulator game - it's a space bridge simulator game. You run the game on six different computers, and each computer runs a station on a single virtual starship. You know, like Weapons, Communications, Engineering, etc. By networking the computers together, you and your friends can become the crew of your virtual ship. Once you've fought over who gets to the captain and bark out orders, you can run user-created missions and defend the galaxy. 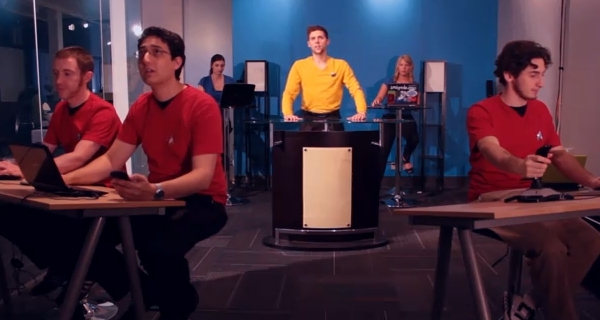 With six geeky friends, six computers, and a room you can network them all together in, you can live the dream of workin on the crew of the starship Enterprise...well, the Artemis for copyright weapons, but we all know the truth. Check out the hilarious videos below that show the fun you can have with this epic game. UPDATE: Apparently, with the latest version, you can play the game over the Internet. Sounds cool, but I think the most fun will be had in person. Here's a video from a demonstration of the game at GenCon 2012. If you want to find out more about the game, check out an article on the game and interview with the creator and lone programmer Thomas Robertson at Penny Arcade. If you can't get the equipment or the buddies together for this game, you can still try out the single-player home game Star Trek: Bridge Commander . It's a classic that simulated the first-person perspective of commanding a starship. Then there's Star Trek Online , the MMO that's running right now. Would you play Artemis? What have you always wanted to do on a starship bridge? Let us know in the comments. Come on, what Trekkie has that many real friends close by? That is too geeky for me. I could fill the bridge, but got better things to do late on a Friday night. People that devoted are a little scary. Enjoyed the shows but don't want to go beyond that.